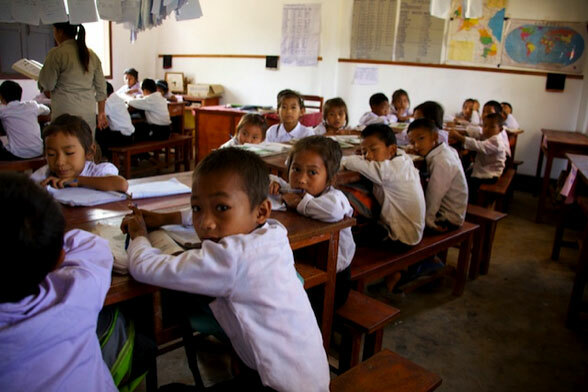 The Vangdoy School in Laos was our very first school! We had talked about building schools in developing countries on our treks over the past few years. But nothing had ever come of those discussions until John Wood, the founder of Room to Read, spoke to the San Francisco chapter of Tiger21, a peer-to-peer learning group to which Al, Kjell and Leo all belong. Unfortunately, Kjell and Leo were absent that day. But Michael Sonnenfeldt, the founder of Tiger21 was in attendance. John's presentation impressed Michael enough that he and his wife offered to co-fund a school with Al and Anne. Suddenly, all of that idle chatter over the years had become real. A special "thank you" to Michael, his wife Katja, and the Goldman Sonnenfeldt Foundation. Without their help getting things off the ground, we might still be just "talking." 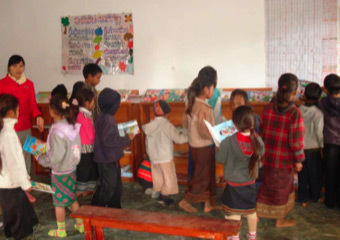 Young Students in their New School! Checking out the new Library - the first one they have ever seen! The Community: Vangdoy Village is located in Bounneur District in northern Laos. The road to this area is good and the village is accessible in both dry and wet seasons. The village contains 101 households with a total population of 317, of whom 162 are female. The people living here belong primarily to the Ekor and Phou Noy ethnic groups. Trade with China is the primary driver of the economy since Bounneur District shares a border with the Yunnan District of China. The main occupation is rice farming, supplemented by raising livestock and growing foodstuffs such as watermelon, sugar cane, and peanuts that are exported to China. The weather is generally good all year round and the winter is quite cool, with temperatures in December to March ranging from 0 – 5 degrees (Celsius). Winter is followed by a dry season from April to May. 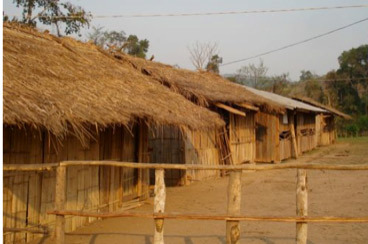 Houses are constructed primarily of wood, bamboo and concrete, and vary in style according to the ethnicity of their inhabitants. The village has communal toilets and access to water but no electricity. The Ho Chi Minh trail, part of which runs through Laos, was a major target for American bombs during the Vietnam War. As a result, many provinces in Laos were heavily bombed and/or covered with landmines. Phongsaly Province was less affected by the Vietnam War than some other provinces in Laos, but a certificate from the government certifying that all unexploded ordnance (UXO) has been removed from the area is still required for all construction sites. What was there when we started: Vangdoy Village has a river running though it and the Vangdoy School serves students from both sides of the river. 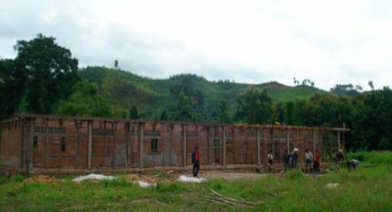 This school was built by the community using wood and bamboo from the forest and has a grass roof and dirt floor. It is unsafe in windy and rainy weather, and classes cannot be held under these conditions. In addition, after students complete grade 3, they have to walk 6 km to reach the nearest school where they can continue in grades 4 and 5. The community sees the importance of education and would like their children to continue studying. For this reason they asked Room to Read for funding to build a more robust school where the students could study in safety and comfort. In addition to the obvious need for a better building, the Room to Read team was impressed with the energy of the members of this community and their commitment to educating their children. What's there now! 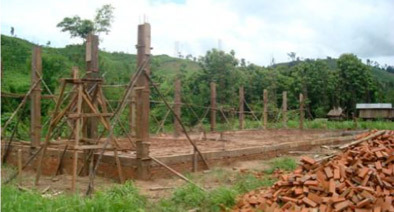 Construction of Vangdoy Incomplete Primary School was started on May 15, 2009. It was co-funded by Opportunity for All, Room to Read and the Vangdoy community with strong support from the PES, the DEB, and the district governor's office. The building took 5 months to complete with labor provided by 1,100 volunteers from the community and was ready for use by November, 2009. This building replaced the old school, a building that was in poor condition. The new building covers an area 28m long x 8m wide and is a sturdy, 4 room brick structure erected on a concrete foundation, with steel-reinforced ground and roof beams and a green sheet metal roof supported by a hardwood frame. The building exterior has been painted a cream color with purple trim on the window shutters. 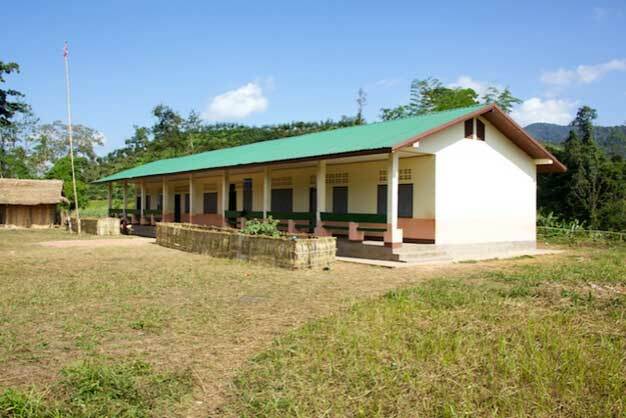 Each of the classrooms is 6m x 7m in size and has a painted white interior, a wood ceiling, and windows with hardwood shutters. The building is equipped with 2 bathrooms. 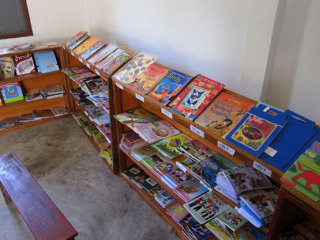 Three rooms are used as classrooms, serving students in grades 1 - 3 and the remaining room serves as the library.